Inside the agreement signing between ADK Hospital and MV Medical PLC on 4 July 2018. An agreement has been signed between ADK Hospital and MV Medicals PLC to promote medical tourism in the Maldives. 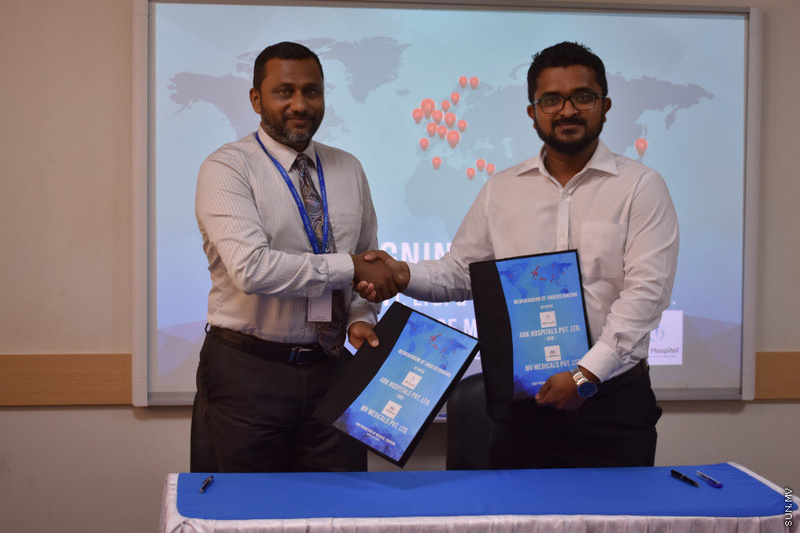 The agreement was signed today by the the Managing Director of ADK Hospital, Ahmed Affaal and the Director of Marketing and Public Relations at MV Medicals, Abdul Jaleel Hussain, at a special ceremony held at the ADK Hospital. Speaking at the ceremony, Affaal said that numerous efforts will be made to promote medical tourism with the intent of bringing people from other countries for medical treatments in the Maldives. He said that many people are going abroad for simple treatments and so the health sector has to gain the trust of the public. And three areas of orthopedics, cardiology and neurosurgery will be focued to create that trust with the health sector. Affaal said that there are challenges when starting out but they are confident that it would be successful. Talking to the press after the signing, the MV Medical's Jaleel, said that the target is to bring eight to ten people from abroad for medical treatment in the Maldives within a year. And if that is achieved, it would be a great success. President Yameen sends felicitations to U.S.